It is 2017: your graphics cards should resemble a lightsaber and you should have 10 Gigabit outfitted in your home – otherwise, you’re clearly not even trying. 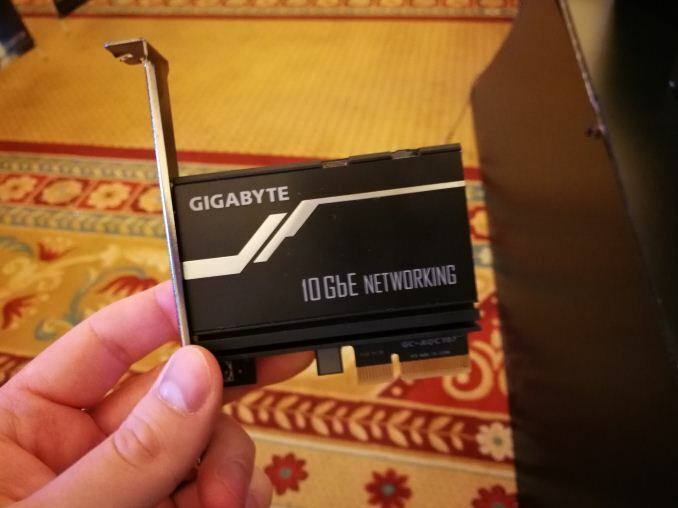 According to Anandtech, GIGABYTE has officially launched their GC-AQC107 networking card, supporting 100M, 1G, 2.5G, 5G and 10G networking capabilities over CAT5e, CAT6/6a and RJ45 connections. WHOA. 10×1=10. IT IS UP TO 10X FASTER. It supports things faster then anything I even can support over my network so therefor I need it. This is how it works, right? Shitposting aside, I know this actually would be extremely nice to have during my regular peer-to-peer transfers that I do. As a content creator, nothing is more annoying than waiting for files to finish backing up after a long shoot. Other content creators like video producers, graphic artists, etc, should only benefit to having their whole network setup to handle 10Gb; those that just game and watch an occasional Netflix flick shouldn’t bother, in my opinion. There is no official price but Anandtech expects this to be around $100, which is not as bad as I expected. You can actually find the card on Amazon but no word on when you can order it. For more info, you may find the product page here.